The world we build for ourselves -- from our homes and offices and factories to our parks, our roads, our cities as a whole -- is the subject of the National Building Museum, the only institution in the United States dedicated to American achievements in architecture, construction, engineering and design. Created by an act of Congress, the Museum presents permanent and temporary exhibitions; collects artifacts of design and construction; publishes books and an award-winning journal, Blueprints; and offers a wide variety of programs. From workshops on building crafts to tours of landmark buildings and construction sites, as well as films, lectures, concert series, and symposia, these programs delight and educate students, families, and adults. The Museum is located at 401 F Street NW in Washington, D.C.
On permanent display at the Museum is the interactive, hands-on exhibition Washington: Symbol and City, presenting a comprehensive look at the growth and development of the capital of the United States. Offering a singular overview of the city's monuments and neighborhoods, as well as its historically important urban plan, the exhibition is a perfect first stop for visitors to Washington, D.C. 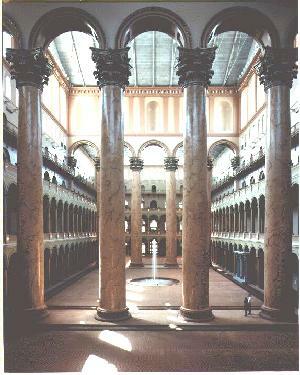 The magnificent Great Hall of the National Building Museum -- with its elegant Italian Renaissance design, central fountain, and eight colossal Corinthian columns -- never fails to astonish visitors. 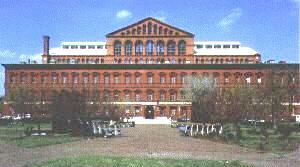 National Building Museum tours are offered daily. architectural renderings of the Kress five and dime stores. Washington: Symbol and City. Permanent exhibit. Inside view of this magnificent Hall. was designated by an act of Congress in 1980 as the site of a new museum to celebrate American achievements in the building arts. Photo: Terren Baker. Elly Muller, Public Affairs Manager.